We are a group of experienced professional women who came together to help organizations thrive and grow emerging women leaders into meaningful leadership roles. Our diverse and hands-on experience gives us a unique perspective into challenges and opportunities facing today’s leaders. Pat Dziuk is a 31-year construction industry veteran. Initially in field office and light trade positions followed by extensive quality control and project management on large commercial projects she ventured on her own 15 years ago as owner of a design-build general building contractor and construction management firm, WBE Contractor. A woman-owned small prime contractor, Pat is keenly in-tune with the challenges and opportunities for women in the industry. Much of her work focus is in collaboration, teaming, and pioneering means and methods for effective execution of US Department of Defense work including minority inclusion in the U.S. and in the Middle East. Her enthusiasm in spreading awareness of the unique value that women add to business while engendering appropriate inclusion has evolved throughout her entire career. Initial works to instill effective change and spontaneous awareness of bias began many years before her decision to dedicate her work to it at Above Glass Ceilings, now actively helping to anchor the pivot to a gender-parity mindset. Ann has 16 years of professional experience in marketing, change leadership, strategy, and communications. Her experience brings tremendous value to the space of advancing women in the workplace. Ann is an avid teacher and a mentor, working with employees and industry groups to educate and empower professionals to move forward and create lasting cultural shifts in organizations. Ann’s innovative thought leadership and dedication to helping others will help build inclusive workplaces and expand opportunities for women and businesses. Nancy Novak is a 31-year construction industry veteran. She started her career in construction and progressed to currently serving as a National Vice President for Compass Datacenters, a data center solutions company. She provides national leadership to operations teams across the country and works with leadership to strengthen company’s ability to scale innovation and knowledge and bring national consistency and strong operating culture. Nancy is the only female national Vice President of Operations in the company and one of only few women represented in the company’s leadership. She is also a strong advocate and mentor to women within the company, as well as in the industry. Her passion for advancing women in business occurs through organizations like Women In Government Relations (WGR), Women Construction Owners and Executives (WCOE), the World Trade Center Institute (WTCI), and the Sewall-Belmont House in Washington, D.C. Currently, Nancy is an active board member at the Sewall-Belmont House & Museum, which is committed to sharing the untold stories of women’s history. In addition, Nancy is a Visionary Champion for Above Glass Ceilings, a consulting company focused on advancement of professional women. Tawnya is a Doctor of Philosophy Ph.D. English Literature with emphasis on South East Asian Literature. She is a graduate of Randolph-Macon Woman’s College and received her M.A. in English at The George Washington University. Ravy has been an instructor of composition and literature in higher education since 2009. She is currently working at a private educational center for advanced K-12 students. 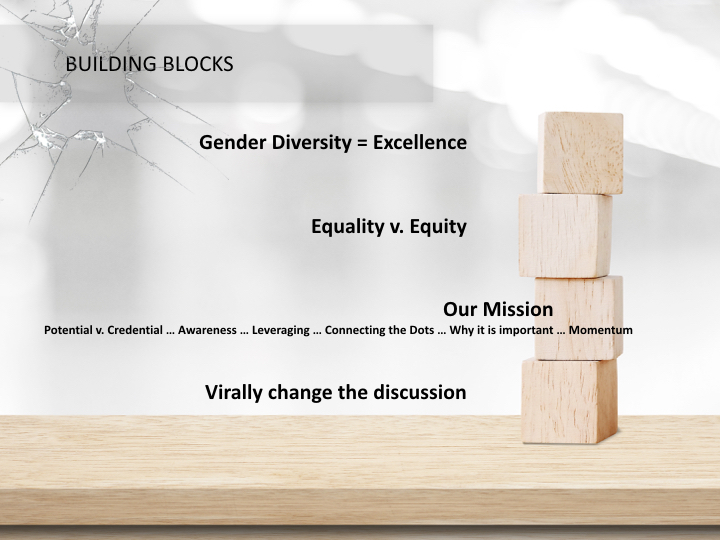 Video content on empowerment, the glass ceiling effect, and the business case for gender equity coming soon!